In the quest to enhance the services at the new Navua Hospital, the Ministry of Health and Medical Services had promptly undertaken all the required work to get the kitchen up and running. During the parliamentary session in February this year, the Minister for Health and Medical Services, Hon. Rosy Akbar had emphasised on the Ministry’s commitment to have the new Navua Hospital Kitchen fully operational by April 2017. As such the work has been completed and the kitchen has been in use, providing locally-prepared meals for patients, as of last week. 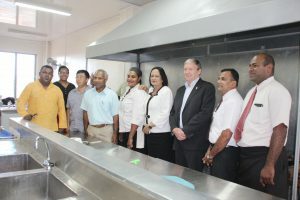 Minister Akbar took a tour of the new Navua Hospital and also inspected the operations at the kitchen that has been renovated with cost of $42,000. Minister Akbar said the renovations has been completed through a close collaboration between the Ministry of Health and Medical Services, the Ministry of Infrastructure and Transport, the Construction Implementation Unit of the Ministry of Economy and the Prime Minister’s Office. “I am also pleased to be able to report that further preparatory works to improve plumbing, landscaping and drainage are under way and should be completed by July this year. The Fijian Government remains committed to developing a healthy Fiji and as such nothing is more important to the Government than improving the health care facilities and services for people throughout the country. “This new Navua hospital has helped to improve the lives of the people of Navua by giving them access to an enhanced health facility that, unlike its predecessor, is no longer subject to the whims of Mother Nature. Of course, building and equipment are only a part of what underpins a well-functioning health system and the Ministry is also committed to better levels of compassion, empathy and sensitivity shown by our caregivers. “I can assure the Fijian people that is also one of my Ministry’s top priorities. Whenever a patient visits a hospital or clinic they should feel like the doctors and nurses are fully vested in their health and recovery. Nothing less in acceptable,” Minister Akbar explained. The Health Minister also revealed the upcoming plans for the new Navua Hospital to establish a training centre for emergency medicine for all the staff in the public health facilities. This is pursed through the Memorandum of Understanding (MOU) signed between the Ministry of Health and Medical Services and the Guangdong Health and Family Planning Commission, People’s Republic of China in 2015. The delegation from the People’s Republic of China recently visited the Navua Hospital to further explore the potential of establishing the Fiji Guangdong Medical Training Centre. 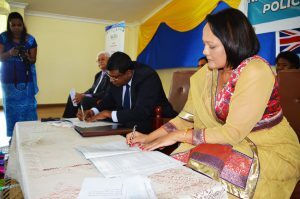 The partnership between the Ministry of Health and Medical Services with UNICEF has created opportunities for enhanced learning on providing effective nutrition response for emergency preparedness. 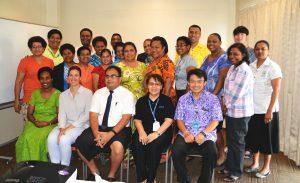 The partnership has created a 3 days workshop called “Nutrition in Emergencies” that was held from Tuesday 20th to Friday 22nd September at Tanoa Plaza in Suva. 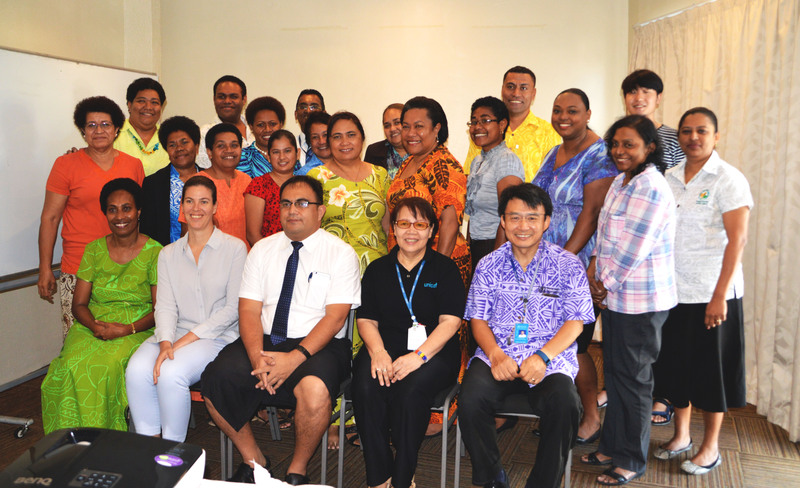 A total of 25 participants comprising of representatives from Ministry of Health and nutrition sub-cluster along with stakeholders from the World Health Organisation, Fiji National University and Secretariat of the Pacific Community are part of this training. The workshop was officially opened by the Deputy Secretary Public Health, Dr Eric Rafai. He emphasised on the importance of the training for capacity building of the nutrition sub-cluster. “Timely and effective nutrition response is our common goal and our responsibility as the health and nutrition sub-cluster. This workshop will support strengthen our existing preparedness plan and response to emergencies in future especially during the implementation of intervention in the communities. “This workshop is an opportunity to start identifying and prioritising key action that we see as critical towards providing effective protection of the nutritional status of the girls, boys’ women and communities in Fiji,” Mr Rafai said. He thanked the nutrition sub-cluster members for their hardwork to reachout to the families who were affected by tropical cyclone Winston. “Nutrition sub-cluster has continued to improve in terms of its capacity building and in mobilizing the other organisations and nutrition professionals, increase in number of interventions including capacity building to strengthen the Integrated Management of Acute Malnutrition. We can collectively do much more to ensure adequate support is provided to our community and the children of Fiji,” Mr Rafai elaborated. The Fijian Government through the Ministry of Health and Medical Services will undertake new action plans to improve the public health care services in Fiji. This was highlighted by the Minister for Health and Medical Services, Hon. Rosy Akbar while speaking in the parliament today. Minister Akbar outlined a number of initiatives that would be implemented to increase the health care accessibility. The initiatives highlighted included the Nurses Specialisation Program, arrangement of locum doctors, free medicine program and capacity building of medical expertise. “The Ministry embarked on a nursing specialisation program over the past several years that sent our nurses overseas for attachments in specialised areas. These nurses have performed extremely well and have brought knowledge and expertise back to Fiji that they can pass on to their counterparts. “We are working with the Ministry of Civil Service to develop the remuneration packages and structure that we need to recruit and retain top-talent,” Minister Akbar said. The Health Ministry will also embark on new measures to reduce the long patient waiting queues in public hospitals. “We have confirmed that there will be a pooling of locum doctors who can fill in during busy periods to help remedy the doctor shortages we face. That means shorter queues and more opportunities for Fijians to seek treatment when they need it. A locum arrangement with Nadi Hospital is currently underway and others will start up around the country on the basis of need. “The locum arrangement will bring in general practitioners to support our health sector in critical areas. It is an immediate fix to the service delivery issues that we face until we are able to staff our hospitals appropriately. Substantial resources are allocated towards recruiting doctors from overseas to fill gaps in both the clinical and public health arenas. “We are currently working intimately with the Ministry of Civil Service to fill those gaps, so far have approved 879 new positions for medical superintendents, consultants, Chief, Principal and Senior Medical Officers and medical interns and assistants. “So far we have filled 553 of those positions, and we will continue to seek qualified professionals for the remaining 326 spots. These new recruitment efforts come on top of the recent pay-rise ranging from 56 percent to 81 percent for our doctors, which has made major strides in increasing job security and satisfaction, it has given our doctors the professional recognition they deserve,” Minister Akbar elaborated. In the new action plan, the Ministry will aspire to develop hospitals that provides clean environment and professional healthcare services delivered with a lot of compassion and empathy. As of end of this month, a compiled a list of medicines will also be made freely available to eligible members of the public, through the Fijian Government’s Free Medicine Program.